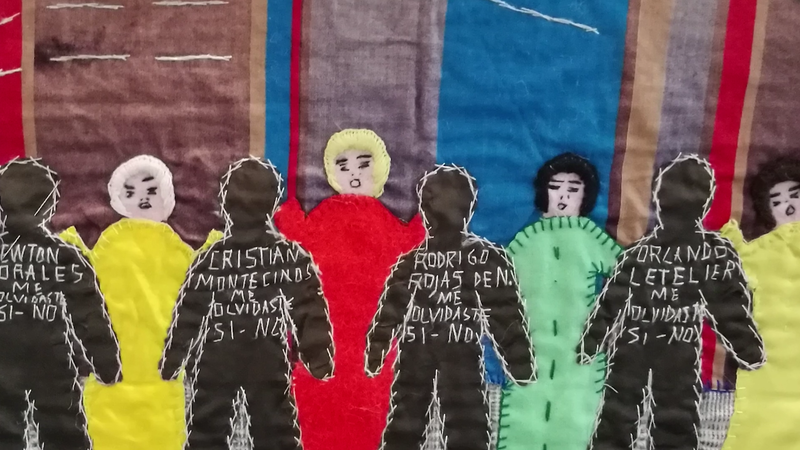 ‘Crafting Resistance: the art of Chilean political prisoners’ examines how craftwork made by political prisoners during their internment in the 1970s by the military regime led by General Pinochet has contributed to the mental health and well-being of those involved, particularly following their exile to the UK. The film engages with important issues around forced migration, well-being and resistance, showing how even in the most extreme circumstances it is sometimes possible to exert a degree of agency and demonstrate resistance. Given the longevity of the Chilean experience, the film illustrates how people live with the aftermath of torture and incarceration. The film is directed by Carmen Luz Parot and ex political prisoner, Gloria Miqueles. Previous to the film screening at Birkbeck Cinema, we interviewed Jasmine Gideon, producer to the film and Senior Lecturer in Development Studies at Birkbeck. Crafting Resistance, the film we are watching today, is part of a larger project dedicated to the memories of Chilean ex-political prisoners, which included the exhibition of a collection of art works crafted by the people interviewed in the film. Could you tell us more about how the exhibition project started? It started with some work I did on health seeking strategies amongst Latin American migrants, mostly in London. I felt the need to narrow it down to one specific group. I had contacts with the Chilean community, predominantly through a person who has been involved in the film and is a former Birkbeck student, Gloria Miqueles. I met her when she came to Birkbeck, she was on my master’s program. At the time I had already worked in Chile and had done previous research about the Chilean health system. I talked to her about various issues and she raised some concerns that she and her friends in the Chilean community had about life in exile and how that played out when you retire: health, wellbeing, etc. I then decided to focus the research on the Chilean exile community, especially health and wellbeing in the context of exile, as it brings in lots of interesting dimensions, such as migration, refugees and so on. I did quite a lot of interviews with different people in London, Sheffield and other places where there are small Chilean communities. Through those interviews and talking with Gloria and other people, the idea started to slowly emerge: we could do an exhibition with the objects that people had made in prison camps. I was interested in using them as a way to get people to tell their stories, almost like a research prop. Gloria was the person who convinced people to part with their objects because obviously they’re not financially valuable, but they have a lot of emotional importance for those individuals who own them. It was a big job to get people to lend their objects. It took quite a few months and we thought we would perhaps get 20, possibly 30 objects. Amazingly, we had over 100 objects. I think we have the biggest collection of craft objects that exists, even bigger than the one the Museum of Memory and Human Rights has in Chile,which is a big collection. Considering the exhibition has been touring around a couple of London universities, did you ever consider taking the collection to other places or even to Chile? People have expressed interest: for example, when we first showed the film with the exhibition at the University of East London there was a couple of people involved in both human rights and refugee work in Sweden, who suggested how fantastic it would be if they could have it, because they are one of the countries that is actively taking refugees at the moment and there is a big refugee community from all over the world there. We talked about the possibility of using it as a way to talk about present day issues. But logistically, it is just not possible. And a lot of people talk about keeping the objects for their family members, as they are very representative of a whole period of time and events. So the objects have all gone back to their owners. Gloria was very meticulous about wrapping everything up and labelling everything, cataloguing every piece, and it was a massive job she undertook as she felt very personally responsible for it. Because of course she also knows what was involved in making them and what they represent. What about the film: did Gloria and you work together throughout the whole process? Yes, we have done most of it together really. I have got much more of an academic interest whilst for her it is her personal history. She was herself a political prisoner and she came to the UK as an exile. She has been the person who has obviously got that direct contact with everybody. People know her in Chilean communities and trust her, and I think that without her there was no way I would have got these objects or even been able to make the film. I don’t think people would have been willing to open to me as a stranger on camera in the way that they did because they trusted her. We had this idea about filming and I got some money from the Birkbeck Wellcome Trust Institutional Strategic Support Fund funds for public engagement. Gloria and I had had a few conversations with Derek Jarman Lab and they gave us some practical advice, but I had never made a film before, I knew nothing about making one. So we have been very privileged that Carmen Luz Parot, who is a professional documentary film director and has previous works dedicated to political prisoners, also got involved. Gloria met her at an event in London, Gloria asked if Carmen would be willing to give us some advice on the film. It went from her giving us some advice to having her actively involved. It was something that she was very passionate about and it fits with her other documentary work. It was amazing because she did it all on a voluntary basis and we ended up with a far more professional film than we anticipated. To force people into exile was a fundamental weapon for the Pinochet regime to attack and to partially destroy the Chilean left-wing. But on the other side, exile also means a form of survival. How do you think resistance is personified by the people and art work depicted in this film? What is fascinating about the Chilean group is that the political context here when they arrived was so different from today, so they got a lot of support. Lots of people got university grants, as there was an organization called the World University Service (WUS) that basically sponsored people to come out of Chile. There was a political agreement that they were allowed to bring people out, but they had to study development related things and through the WUS and other solidarity organizations people were given access to language classes and all kinds of support mechanisms. Out of those people I spoke to I would say some of them felt that despite what had happened to them they have had a good life but of course this was not the case for everyone. However, Some of them are very successful professionals in their chosen career although it might not have been the path they started off on when they were in Chile. A number of people I interviewed ended up working in refugee organizations.I think the support they were given led them down that pathway and a lot of people spoke about wanting to make a contribution to society and wanting to give something back after everything that had happened to them and the help they were given. And of course,those that came here in exile were already people who were trying to create a more just and equitable society in Chile. They brought those ideas with them and even today that still seems to be very strong legacy. Even though many are retired they still seem to be very actively involved in human rights related work. And I also think that the whole film itself and the broader project definitely challenges this idea of political exiles being victims or the notion that they have no agency. I think the interviews show very clearly that it is definitely not the case here. One thing I clearly remember from the film is this one scene when the prisoners talk about the moment when they decidedto establish their own rules, how to do the cleaning and organize everything. That surprised me as a decisive moment. Regarding the present state of events in what concerns migrants and refugees, do you know of any similar projects using art as a way of engaging with these or other minority groups? Yes, over the year or two that I have been involved in the film and the exhibition, I have come across people and organisations who are working with Syrian refugees, using poetry, using literature and artwork. I found another organization who was using knitting as a way to talk to one another and sort of build new communities here. When we showed the film at the University of East London I met Ayesha Ahmad who is based at St George’s, University of London, who talked about the work she has been doing in prisons in Afghanistan, with female political prisoners and how they use poetry there as a kind of a means of expressing their hopes for the future. Again it gives a little bit of space where one can demonstrate some kind of agency and some hope for the future. What is the relation/ bond that the protagonists of the film keep with Chile? I would say in the main they are very connected. A lot of them are very transnational and they are quite involved in all kinds of current political activities in Chile, as well as here of course. Some of them have children who have moved to Chile, other are planning on moving back to Chile permanently once they retire. There are very active transnational relationships there and strong links… and of course, there is a lot of the exiles that were here who have now gone back. Some of them went back at specific points, such as after the Pinochet regime ended in 1990, because the World University Service, for example, had a specific program which tried to support people to go back and rebuild society. Others went back and then returned to London and then have perhaps gone back again. Some other people have gone back in the last year or so when they retired here. Sometimes it is about particular moments in their personal history when they go back and others have been more about Chile’s history, when there have been openings. And I know that there are very strong links stillamongst a lot of the exile groups, those who are ex-political prisoners, they are very much in contact. Most people did not keep a relation with art, did they? No. It is really interesting that none did. I interviewed ten people for the film and not one of them does anything anymore. They have produced these really beautiful things… And there is this very strong link between the moment or the reason why they were doing it. And as they say in their interviews, a lot of it is about time. They had so much time that they could sit and do all this and I guess that is an issue: you need to actually have time to do it.